Stylish and sophisticated elevator dress shoe featuring upper in genuine brown shell cordovan leather, distinguished by its unique properties that make it one of the finest leathers in the world. Channel stitched leather sole. 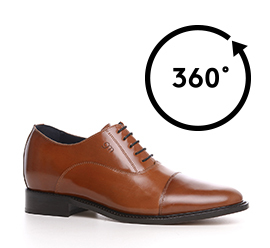 An oxford handmade shoe created for a man with class and able to increase height from 2.4 (6 cm) up to 3.1 inches (8 cm).